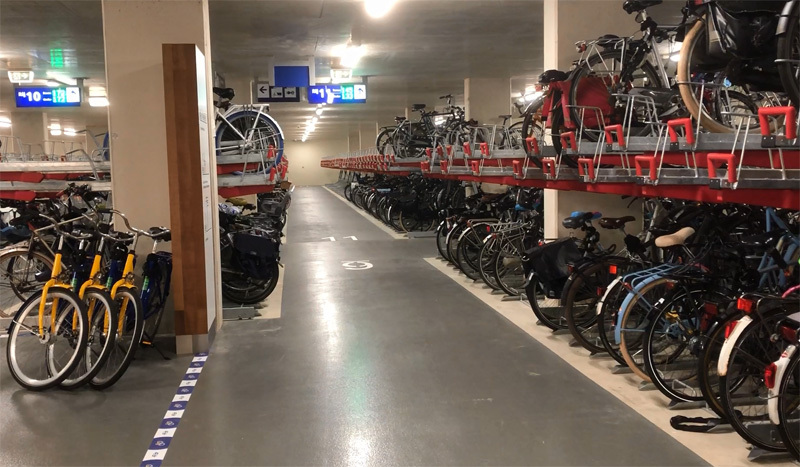 The league of Dutch cities with a huge underground bicycle parking facility near their main train stations has grown again. 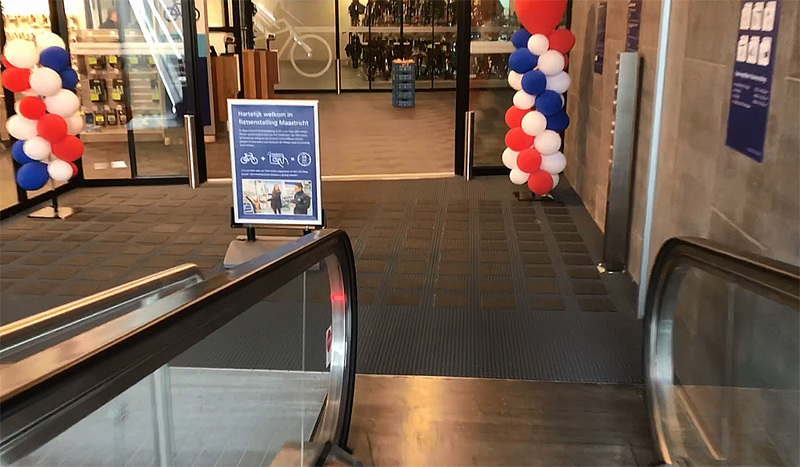 Maastricht opened the latest bike parking garage on the first day of 2018. It has room to park 3,000 bicycles, 5.5 metres under the station square. It is guarded, has a repair service and parking your bicycle is free for the first 24 hours. The entrance to the new underground bicycle parking facility in Maastricht. 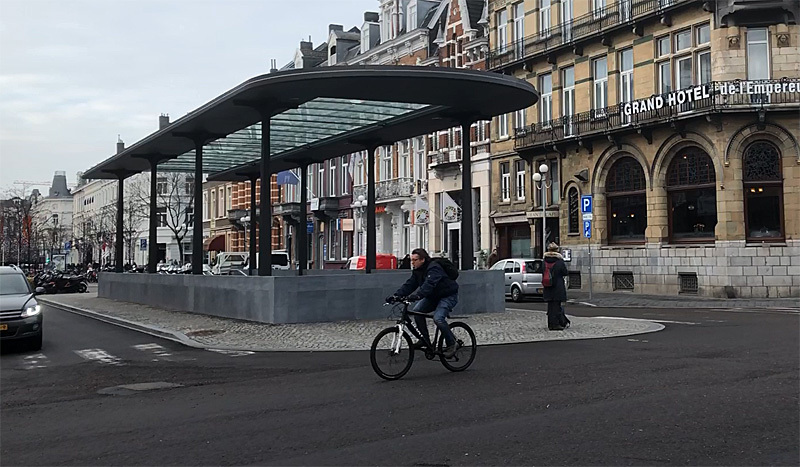 At 6:50 in the morning on New Year’s Day, the first bicycles could be parked in the brand new bicycle parking garage directly under the station square of Maastricht (population 123,000). A huge modern canopy covers the entrance. Two 30-metre-long travelators (one going down and one going up) give an easy access to the parking garage at 5.5 metres below the surface. The purpose of this garage was to increase the amount of available bicycle parking racks. A second aim was give the station area a “quality impulse”. In other words, to get the sea of bicycles, that were parked in front of the station up to now, out of sight. Few other structures give away that this underground parking facility exists. There is a staircase for access by foot and finally a round stone bench has appeared with a glass plate in the centre. That glass plate is actually a sky light that floods the underground structure with natural light. The underground parking is very spacious and light. It has to be convenient and it has to feel safe to get people te use such a parking facility. 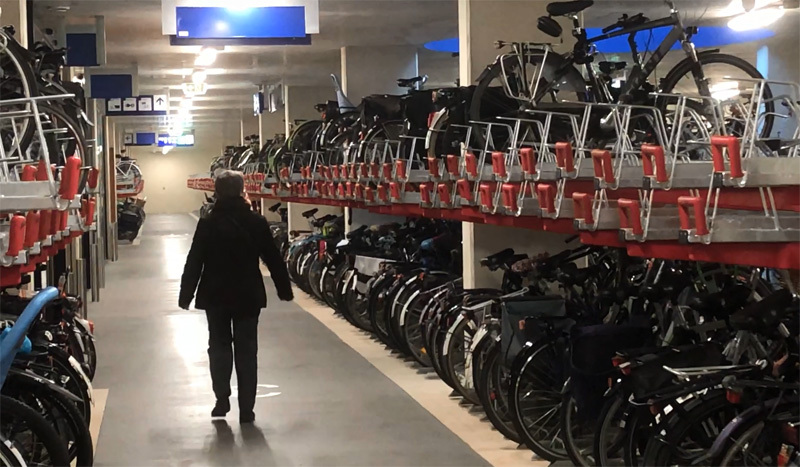 There is room to park 3,000 bicycles in two tier racks, the type that you can find all over the Netherlands, with a hydraulic system that assists people using the upper rack. That total number also includes 100 rental bicycles of the OV-Fiets scheme and the special places for bicycles of types that wouldn’t fit in a rack. There is room for 80 such “extraordinary bicycles”; cargo bikes, tandems, bicycles with baskets or the heavy e-bikes. The Maastricht facility has a completely separated room for 40 mopeds or scooters, which is not something you often see in other facilities. It is good that the smelly machines are kept behind closed glass doors. The main entrance with the travelators to give an easy access with a bicycle. The entrance is located directly in front of the railway station. The entrance on foot is even closer to the station building. The first 24 hours of parking are free. This has become the norm in the Netherlands at railway stations. After that initial day parking a bicycle costs €1.25 per day. If you plan to park your bicycle for longer periods, an annual subscription might be more attractive, at €75,00 per year. You check your bicycle in by swiping your public transport chip card. If you don’t have such a card you can buy an anonymous one for €7.50, that you can then always use. You check out with the people who are guarding the facility. The same people who can also do repairs and take care of the rental bicycles. The parking fee for cargo bikes and mopeds is €2.50 per day and €150,00 for a one-year subscription. This facility is open daily. In the morning from 15 minutes before the first train leaves Maastricht, until late in the night, 15 minutes after the last train arrived. The closing hour is a bit dynamic. When the train is delayed, this facility stays open until 15 minutes after the actual arrival time of the last train that day. These opening times mean that the garage really only closes for a little under 4 hours of the night during the week. During the construction the square in front of the station building was one large pit that filled up with groudwater. Still from an information video by “Via Maastricht”. In 2015, the city council of Maastricht agreed to build this facility. The public and private organisations involved were the municipality of Maastricht, both railway companies, the Province of Limburg and the agency to improve the accessibility of Maastricht. The total budget was 13 million euros. The rail building company ProRail took care of 4.2 million of the total budget. Thomas Kemme Architects designed the facility. 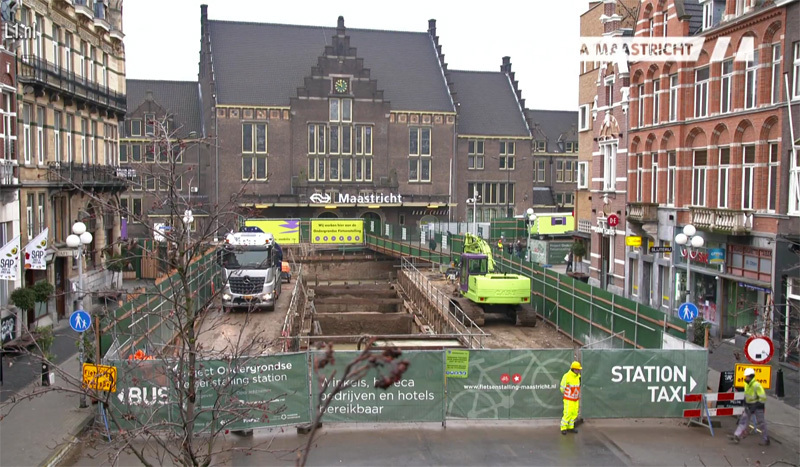 Construction of the main entrance in the narrow Stationsstraat, that had to be completely closed to all traffic but pedestrians. 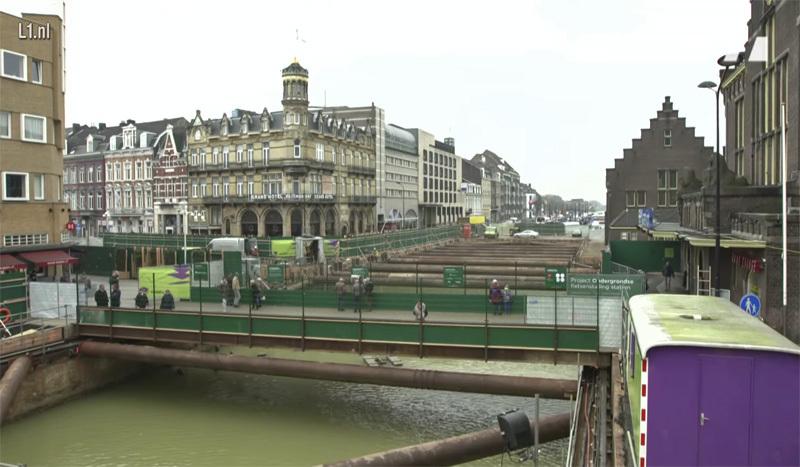 Still from an information video by “Via Maastricht”. This is the view from a temporary observation platform that was built specifically so people could watch the progress of this project. A total of 13 million euros for 3,000 parking spaces means that every parking space cost € 4.333. Which is a considerable amount, but much less than creating an underground car parking space. The building time was about one and a half years, from late April 2016 to the first day of 2018. This woman has just parked her bicycle in a lower rack and she walks to the trains. A welcome sign, balloons and automatic doors swinging open the moment you step down from the travelators. 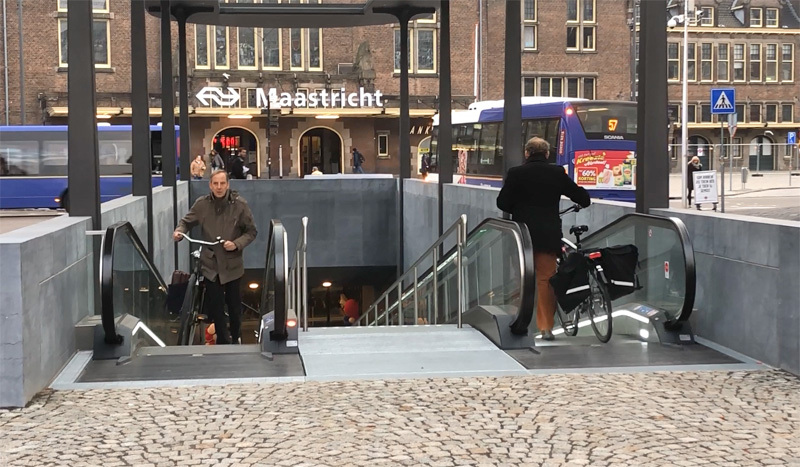 Maastricht is happy to welcome its bicycle parking train travelers! To celebrate the opening of this facility people who came to park their bicycles received a free healthy snack (an apple) in the first few weeks. When I was filming, the balloons from the opening were also still there. Maastricht is very happy with this new facility and rightly so! of the new Maastricht bicycle parking facility. A great post about a “little” cycling facility that can be built in under two years, right in the middle of a busy city with tricky ground conditions and all for a very reasonable cost. Important lessons for the rest of the world. I just read the book Happiest Kids in the World. It’s another example of Dutch success! Excellent blog as usual Mark. Lovely facility, it is hard here in Ottawa (Canada) to convince people that we don’t need to use up so much sidewalk space for cycle parking, but need to take cycle parking into consideration when designing new spaces. One new office building has a ground level parking garage for bikes but the new Public Library planners seemed shocked that someone might ask for a secure bike parking provision rather than just chaining a bike to a tree out front. One question: the Maastricht facility is “guarded” but it looked like there was a beggar already at his post inside the garage (guy with cap out at the exit door), which does not enhance subjective safety. I wrote a brief piece. WRT Eric’s comments, I included some URLs to some UK and one EU publication (“Cycle facilities at interchanges”) that are the kind of best practice examples/guidance that we don’t really have in North America. That guy doesn’t seem like a beggar to me at all, he’s not holding a cap either but some flyer or something. Seems to be handing out some info or whatever is in those crates next to him. Maybe something related to the recent opening of that cycle parking, maybe even works for the parking/city. Probably has permission to be there, if not he’d be send away quickly. A beggar?! Certainly not! That is someone employed by the facility who hands a gift to every user of the facility, namely the apples he has in the crates right next to him. This because of the festive opening. Again this getting the bikes out of sight. Perhaps a paid parking for bicycles there were the taxi stand is now? For those who would like to pay to avoid going underground. Hey Mark. The link you posted to the video about the groundwater being pumped is linked in such a manner that it starts halfway into the video, right after the section about the groundwater, might want to edit that. It’s not a big deal, just a small mistake. Thank you for this post. I will blog it. In my comments on the proposed plan for expansion of DC’s Union Station, I did write about how it could be exemplary and a national example concerning bicycle accommodation. 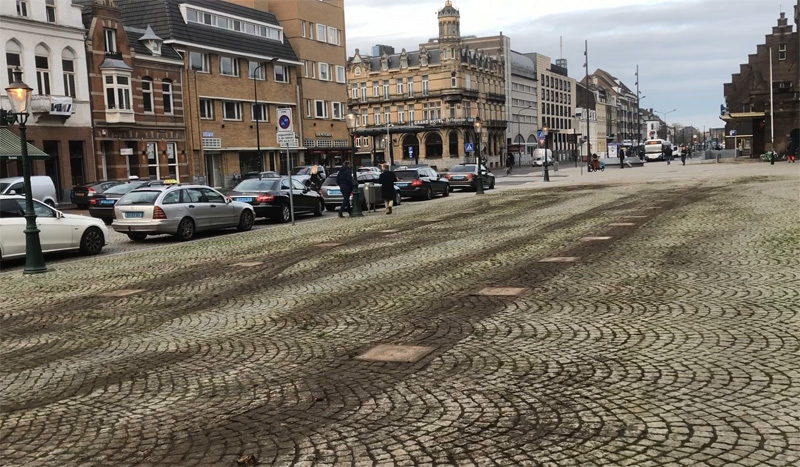 This entry was posted on 30 January 2018 by Bicycle Dutch in Original posts and tagged cycle parking, Maastricht, railwaystations, underground parking.